Do you need Address labels? Shipping labels? Product and Pricing labels? 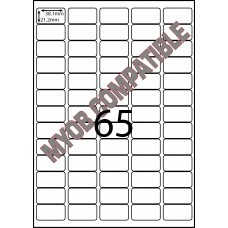 We have high-quality labels on sheets that will suit your need. 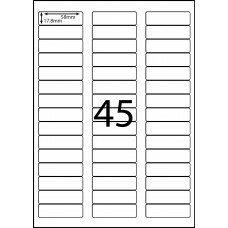 Our Australian made A4 sheeted labels are made for use in laser and inkjet printers/photocopiers so that you can produce your own professional labels in the office or even at home! They are manufactured to the highest standard with top quality adhesives to ensure that your labels stick every time. Our range is compatible with all Avery templates so you can easily access the layout information on Microsoft Word, from the Avery website itself or use your own drawing software to create a design that you love! Our labels on sheets are available in several different stock types, colours and adhesive types to ensure that you are using the correct product for your labelling requirements. For standard address or shipping labels, our Matt White Permanent range is perfect for this sort of application. However, if you are designing your own product labels for use on jam jars, candles, or bath salts, then a beautiful Gloss finish label will give a classy professional look. Our Synthetic labels ensure that your labels stay weatherproof and waterproof if exposed to the elements with their tear resistant material. Clear Synthetic labels can also give a fabulous 'no label' effect on your products whilst also being oil, water and tear resistant too. For warehousing purposes our fluorescent range enables the user to streamline their dispatch process and also can allocate specific boxes that may be problem goods, dangerous goods, or any other issue that doesn't want to be missed. Our removable adhesive range is also fantastic for labelling expensive products such as furniture. The removable labels will stay on for as long as you require but then can be easily removed without leaving any residue behind that would damage the finish of the product. L.G. Business Systems can help you with all of your labelling requirements and if you're still not sure on the type of label you need, then don't hesitate to call our friendly sales staff for their advice!